The depression saw a loss of traffic and revenue for the CRT, but, curiously enough, it also brought a number of system improvements. The Merchandise Mart station, which opened December 5, 1930, was built for its namesake building, finished the same year, which was the largest commercial building in the world with 4.1 million square feet of floor space. The station's fare controls are located on the second floor of the building. 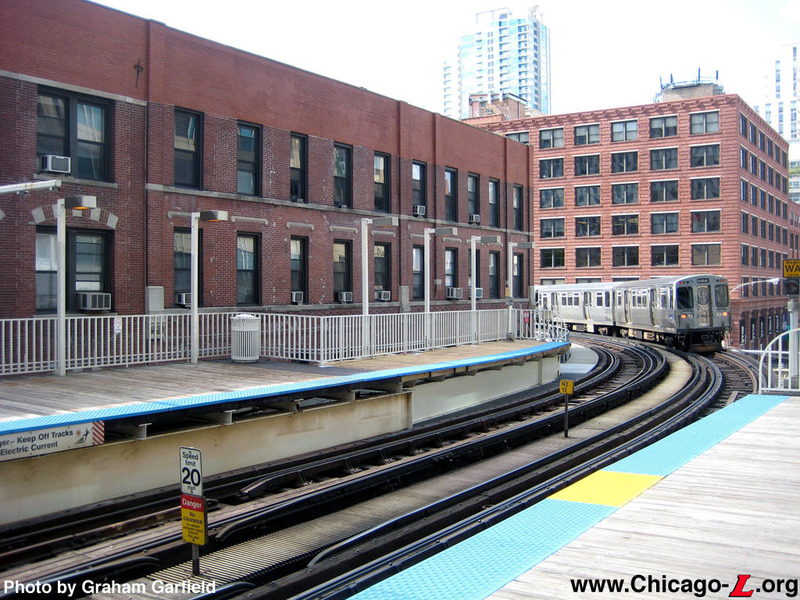 The platforms occupied the site of the former Kinzie Street station, which had been demolished nearly ten years before when the Grand Avenue station opened to the north. 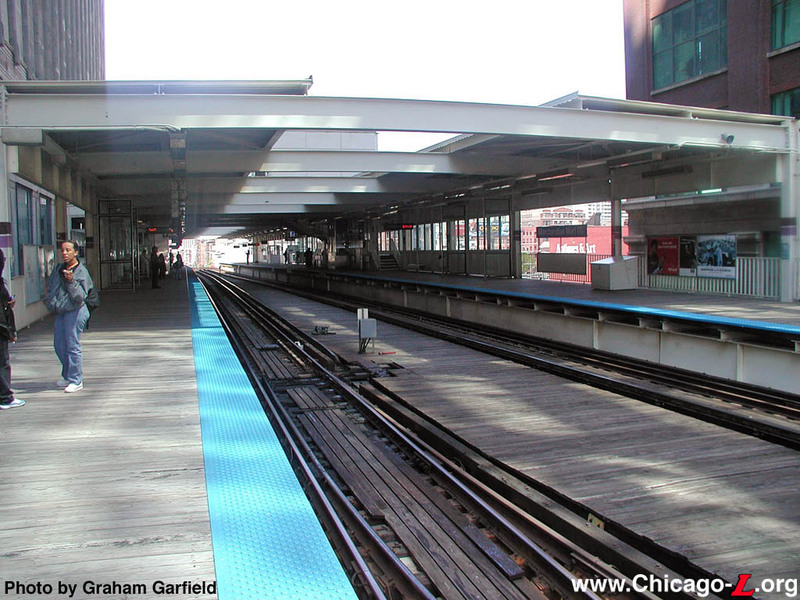 The station, which was built in less than four months, had a platform and canopy design that generally followed those used on the Ravenswood branch. 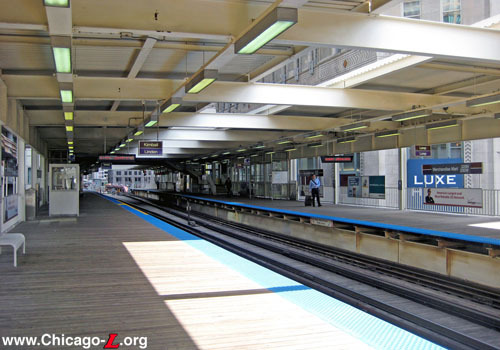 With their gently curved roofs and support columns with latticed framing, this style of canopy had become the standard design for the "L" from the 1910s to the 1930s, found in most new stations and canopy extensions. In some stations, such as Merchandise Mart, the gentle, almost organic-looking curvature of the canopies and enclosures took on an Art Nouveau-influenced look. 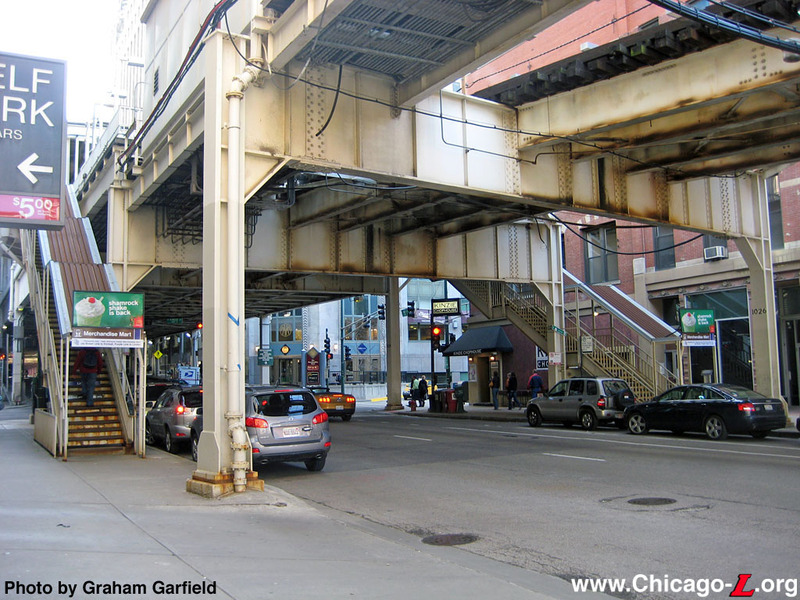 Auxiliary exits were located at the north end of both platforms to the corner of Kinzie and Wells streets. The station also included an overhead pedestrian transfer bridge at the south end of the station that connected the two platforms to the center platform of North Water Street terminal, only a short distance to the east. After North Water terminal was demolished, the bridge over Carroll Avenue was demolished, leaving a transfer bridge between the inbound and outbound Mart platforms. The Merchandise Mart underwent multiple renovations in the second half of the 20th century. The office/retail building underwent a modernization campaign in the late 1950s and 1960s that reflected a broader trend of renovating older, urban buildings that often meant removing ornamentation and detail, replacing it with drop ceilings, metal or plastic panels or other synthetic and streamlined materials. 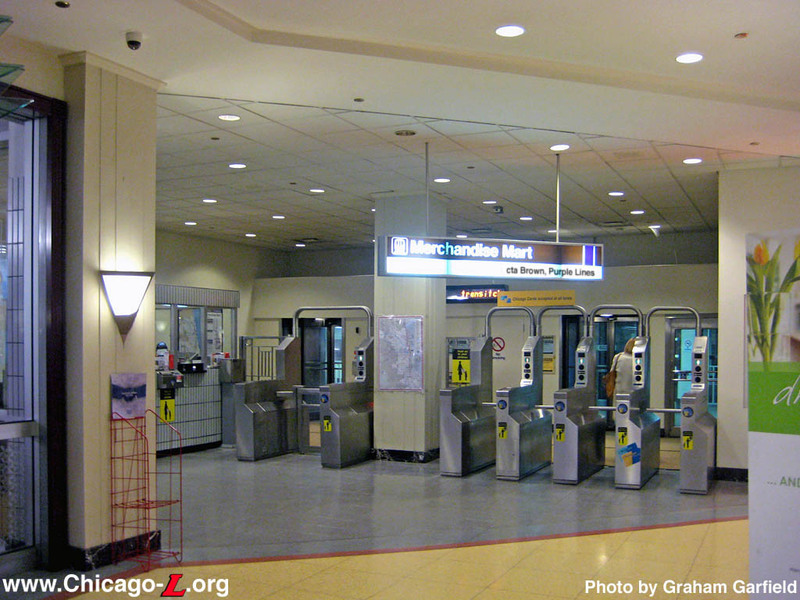 The Mart was subject to just such treatment, and the fare control area was completely modified. Gone were the ornamental wall treatments and agents booths that fit in with the Mart's original Art Deco design. They were replaced with two simple booths of a wooden lower half and glass panels on the upper half. The walls were striped of any ornamentation and an illuminated drop ceiling was installed. The project mirrored alterations to the other public areas of the Mart building, especially the shopping arcade. 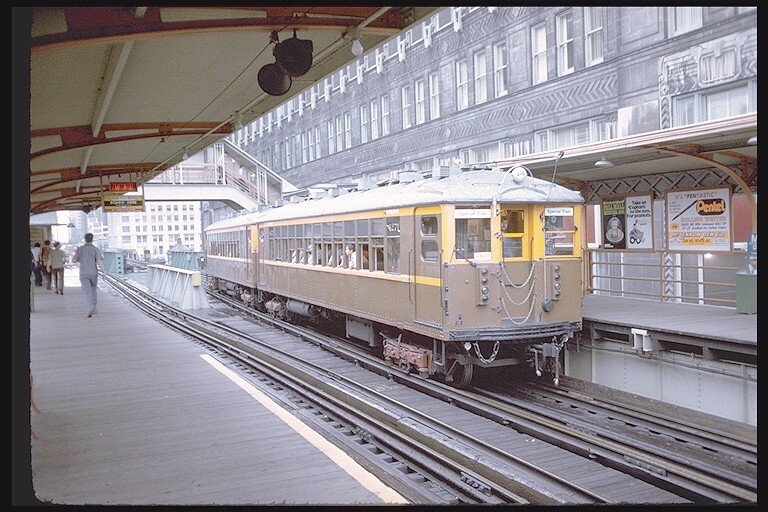 Although the platforms were largely unaltered, the most significant alteration during this period was the installation of a 70 foot moveable platform at the south end of the northbound platform in 1952. The purpose was to extend the platform to allow longer trains to berth, but extending to the north was not desirable because a sharp curve that would've limited the conductor's visibly of the train sides was present immediately north of the station. Immediately to the south was the entrance to the North Water Terminal. 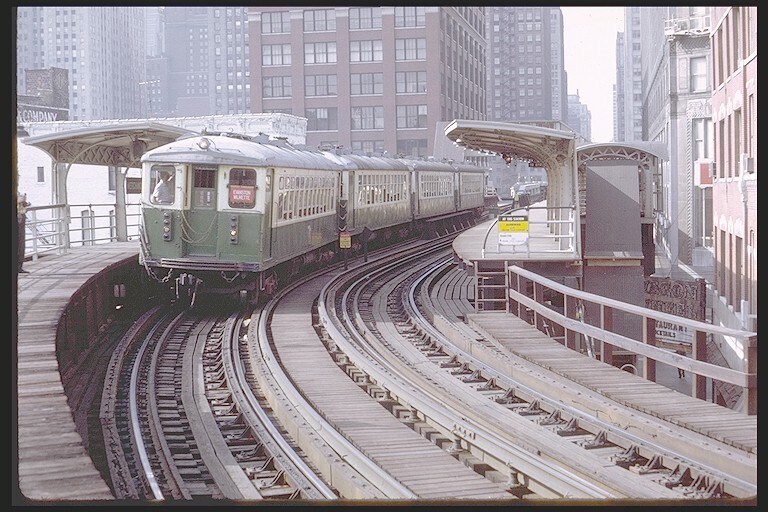 Although the North Water Terminal had been closed on August 1, 1949 in the CTA's North-South service revision, the station and stub branch was still intact and used intermittently for car storage, emergency lay-ups, and charters, so permanently blocking these tracks was not an option. The solution? A segmented platform that extended across the tracks to North Water that could be moved out of the way when necessary. 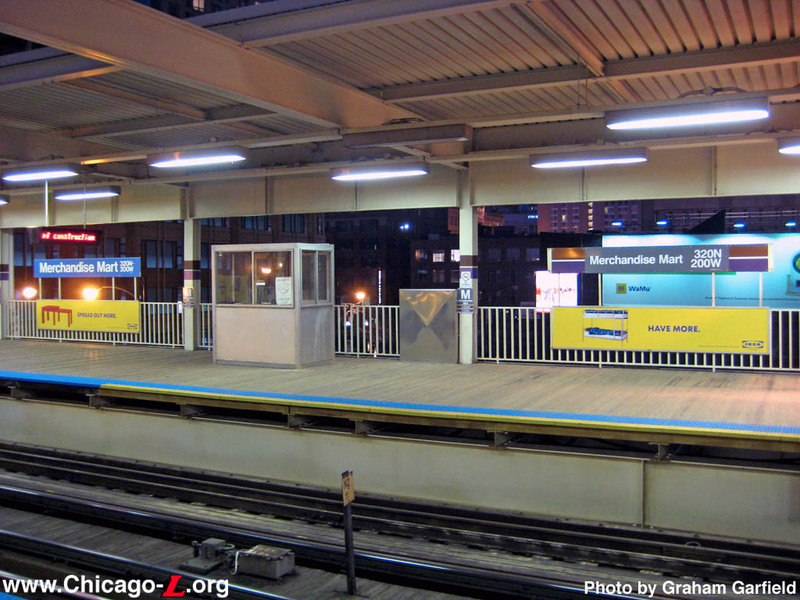 The result was the ability to berth 6-car trains on the straight section of the Mart's northbound platform, while maintaining access to North Water when necessary. 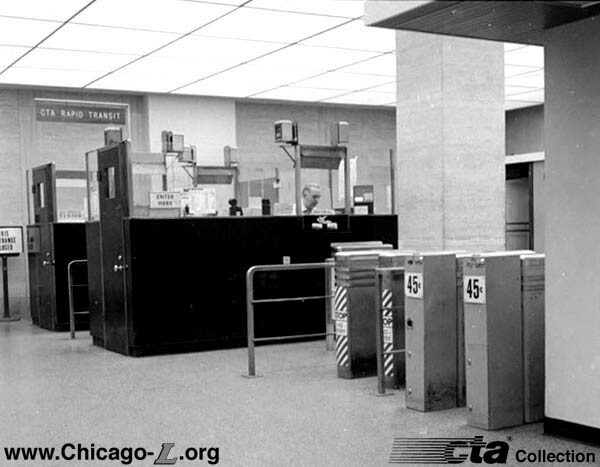 A few years later, in 1959, the auxiliary exit from the northbound platform at Kinzie was modified to act as an auxiliary entrance on a part-time basis, staffed by an agent largely during rush hours only. This lasted until 1973, when it became exit-only again as part of that year's massive cutbacks due to budget shortfalls. 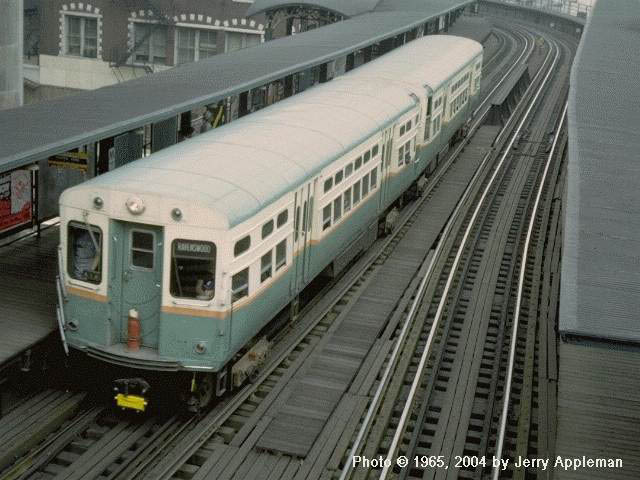 In the 1980s, the Merchandise Mart underwent another renovation and the "L" station was once again along for the ride. The project began in 1986 in the retail/office building, but the "L" portion did not begin until 1987. 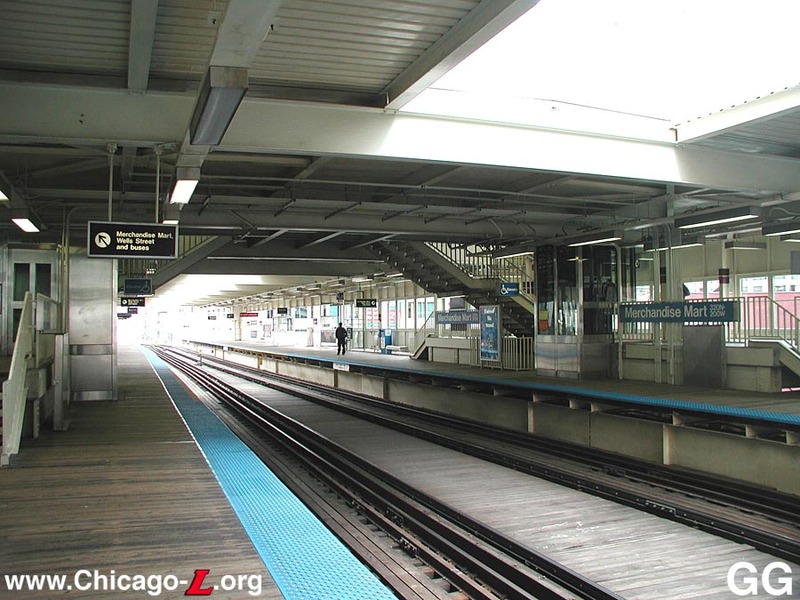 The original 1930 platforms were to be replaced with a modern white steel and glass station of the "open plan" design, characteristic of new "L" construction. In November 1987, temporary stairways were installed at Kinzie/Wells at the north end of the station, replacing the original auxiliary exit stairs. 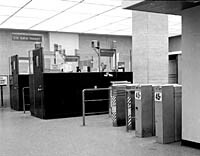 In January 1988, the second floor entrance from the Mart closed and a temporary entrance from the Mart was placed in service. By the end of 1988, the new station was largely completed. The canopy stretches the full width of the platforms, with a skylight running the length down the center. The main entrance and exit remains in the second floor of the Mart, which deposits passengers on the inbound platform. An overhead bridge, with elevators provides for ADA accessibility, provides access to the outbound platform. 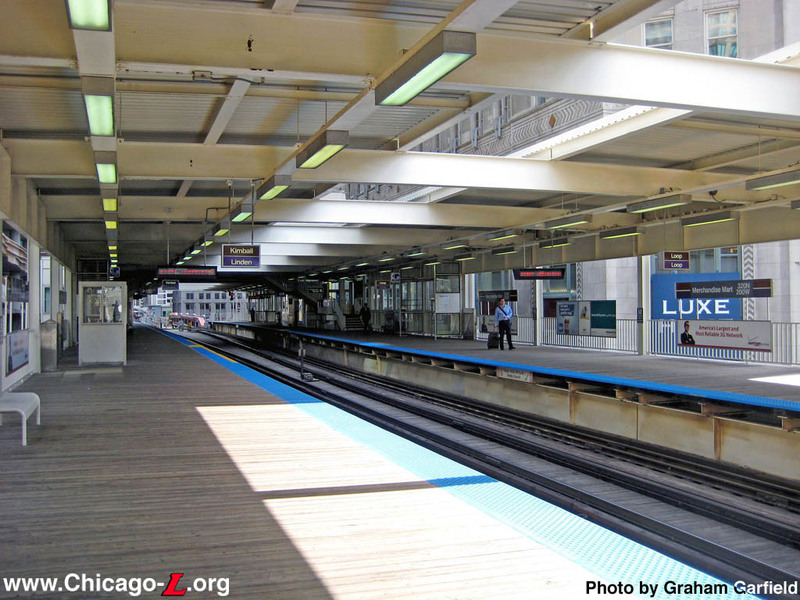 There are auxiliary exits at the north end of both platforms down to Kinzie Street. In 1989, Beyer Blinder Belle, a New York City architecture and planning firm known for its preservation work, was engaged to restore the interior of the public floors and to create a retail center on the first and second floors of the Mart. Upon its completion in 1991, the first two floors of the Mart, which housed a new shopping arcade and an extensive food court, were named the "Shops at The Mart." This interior renovation included remodeling of the station fare control area (now located next to the food court), though the aesthetics are somewhat nondescript and do not share the ornamentation, detail, or historic restoration found in the rest of the first two floors. The CTA's presence in the Merchandise Mart was not limited to the transit station: the agency's headquarters was housed on the 7th floor from 1952 to 2004. 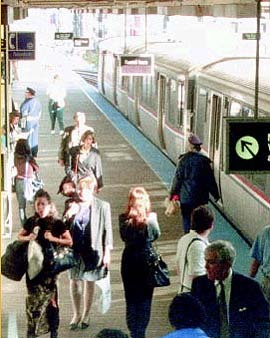 In early March 2008, the CTA replaced the original KDR-style signage with Current Graphic Standard station name signs and symbol signs. The work included removal of the 1988-vintage blue (indicating its former status as a "AB" station in skip-stop operation) column and station name signs on the platform. 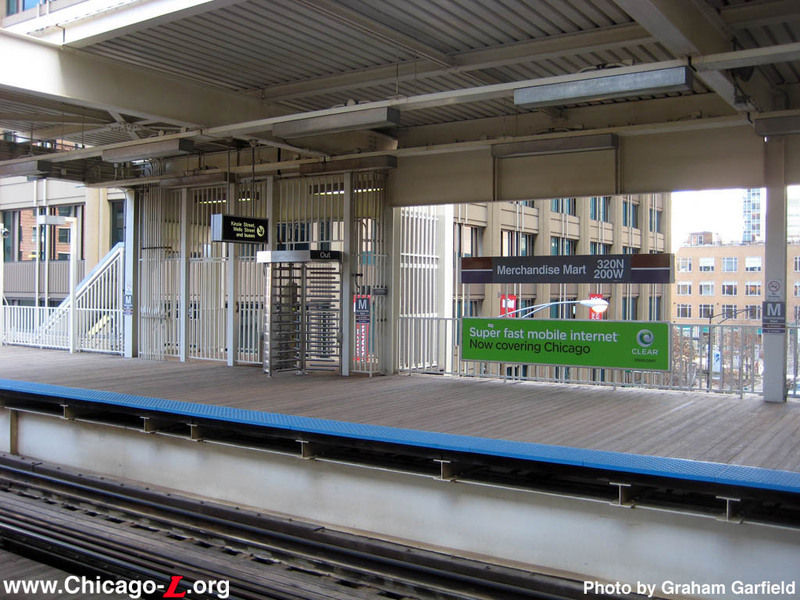 Over the following several months, various backlit signs at the station -- on the platform, on the mezzanine/transfer bridge level, inside the Mart at the station entrance -- were also replaced with new graphics consistent with CTA's Current Graphic signage standard. 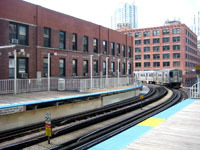 On March 30, 2008, 8-car trains began operating on the Brown Line for the first time, following the completion of reconstruction work (which included, among other things, platform extensions to accommodate eight cars) at a sufficient number of Brown Line stations north of the Mart and temporary closure for reconstruction of those that could not accommodate 8-car trains. 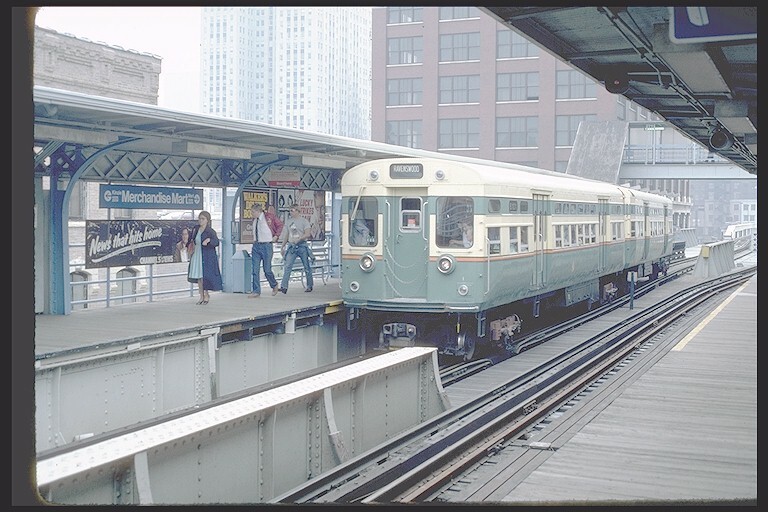 When the Merchandise Mart station was reconstructed in 1988, the platforms were built long enough to accommodate eight cars. 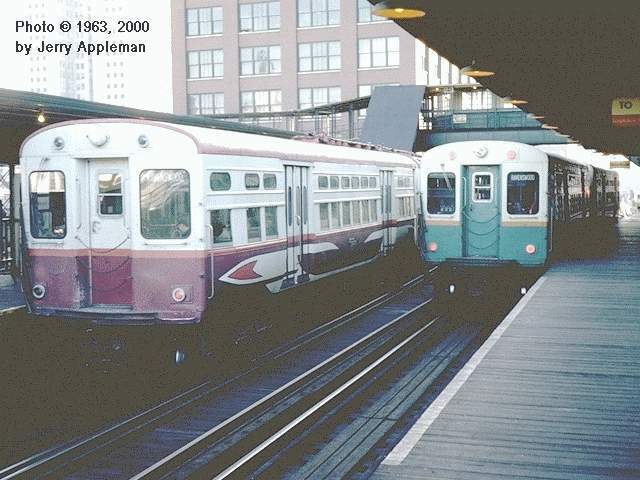 However, knowing that the route only regularly operated 6-car trains at the time and that the possibility of 8-car service was some time off, the manner in which the platforms were situated was not ideal for 8-car trains. 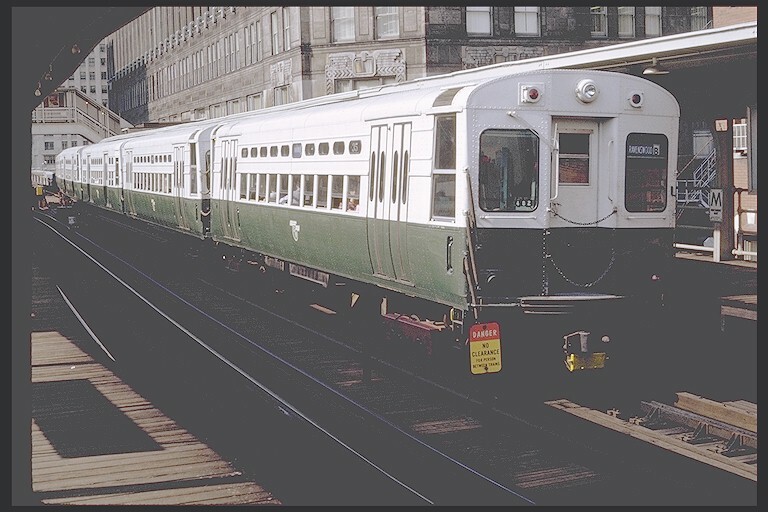 Wishing not to repeat the problems with line-of-sight and gaps between the platforms and train doors that occurred when the original station's platforms were extended north into the Hubbard Curve, the new platforms were moved south, located south of the curve. 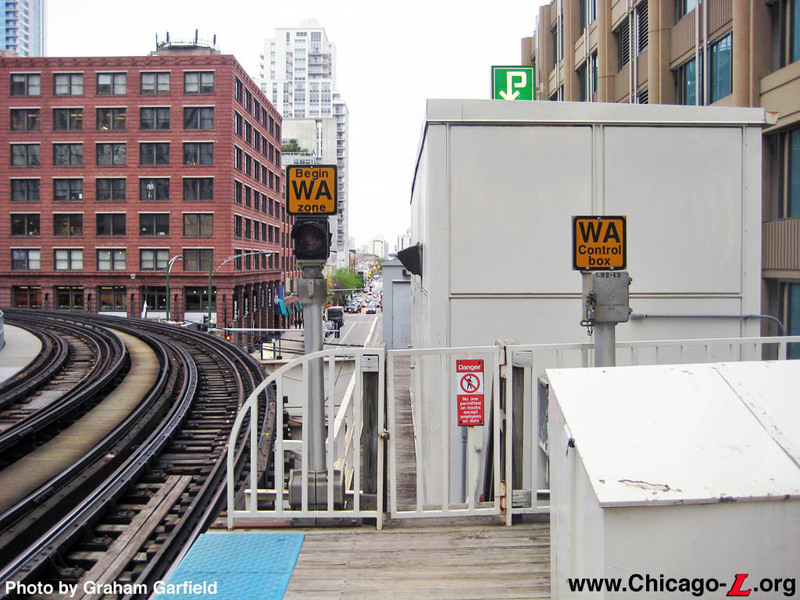 However, this meant that the switch and spur off the southbound track leading into a bumping post -- the switch is aligned to route trains into the post when the Wells Street Bridge is up, as a safety precaution -- and the associated home signal protecting the switch ended up in the middle of the southbound platform. Eight-car trains needed to pull past this signal to berth properly, and if the next train ahead was too close, the signal would be set to "stop", causing delays. It was determined that the best solution was to extend the southbound platform north into the Hubbard Curve far enough for 8-car trains to berth before the home signal. In early 2009, a narrow platform extension was built at the north end of the southbound platform. The extension's railings and lights were designed to harmonize with the existing infrastructure. The extension was completed in late May 2009. On June 5, 2009, berth markers on the southbound platform were relocated. The 2- and 4-car markers remained as-is. Interestingly, the 8-car marker also remained where it was, beyond the home signal. The 6-car marker was moved north, before of the signal. A second, special 8-car marker was also installed about 10 feet north of the signal, with a black "8" on a white background instead of the usual yellow berth marker background, which indicates the stopping point for 8-car trains when the home signal displays a "stop" indication. 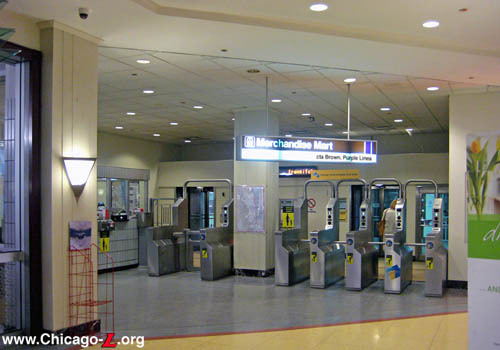 In 2010, Kinzie Street became an entrance point again with the installation of farecard-only High-Barrier Gate (HBG) turnstiles. The exit-only rotogates were removed and replaced with HBGs. 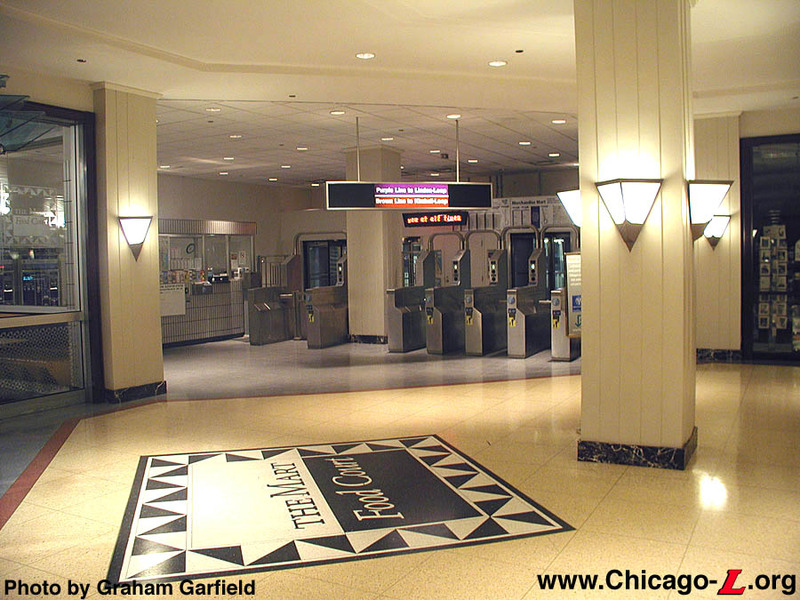 The HBGs allow entrance to the station at all times the station is open, but the entrance is unstaffed and has no farecard vending machines, so customers must already possess a valid farecard to enter at Kinzie Street. The Kinzie exits temporarily closed at 6am, Saturday, March 6, 2010 for the conversion, and upon reopening at 4pm were available for entrance. 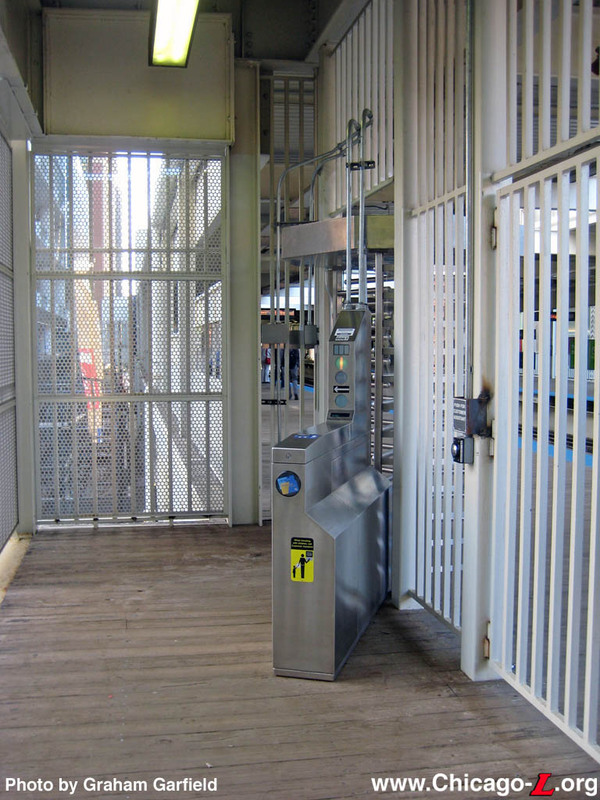 In addition to the new HBG turnstiles, work at the Kinzie Street entrance also included the installation of new signage and a Customer Assistant call button, as well as new paint.